They have been “teasing” us for some time now on their Facebook page, about their new menu and now we got a glimpse of it. 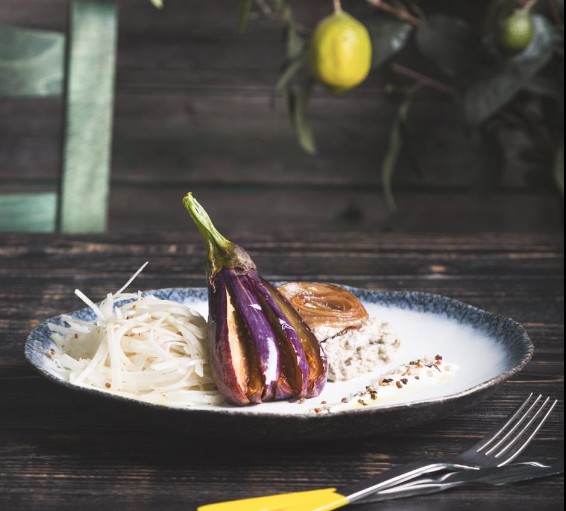 This is the new Eggplant dip (melintzanosalata), with a whole fried eggplant, kouloumbra spaghetti and yogurt-tahini vinaigrette. Tempted? I know I am and I don’t know if I will actually wait for the second teaser or actually go and taste a few of their new dishes. Now that they have “moved” outside to their patio, the place there is so beautiful with the fancy lights, ideal choice for the summer nights. Did you go because you saw it on Cypriot and Proud? Don’t forget to let them know!